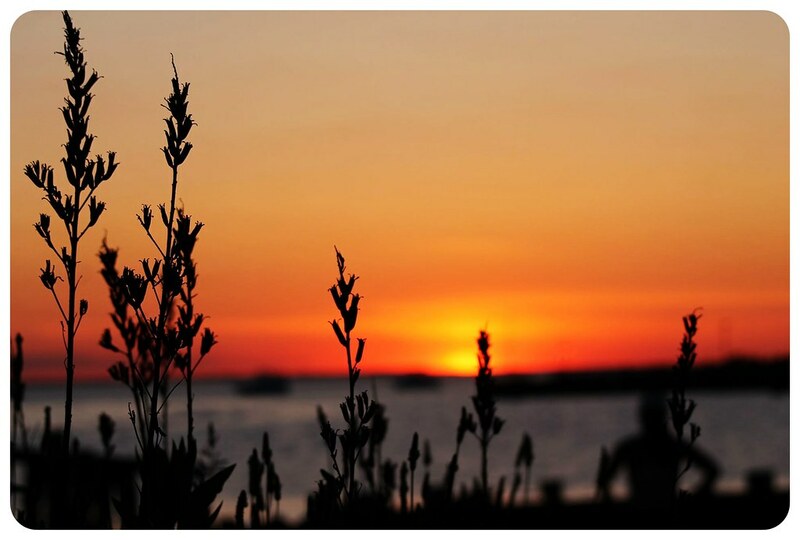 Polaroid of the week: What’s happening over in Jersey? It’s been months now that I went to a proper beach, and so I was happy to have a visitor in town this week – the perfect excuse for a day trip to the beach! 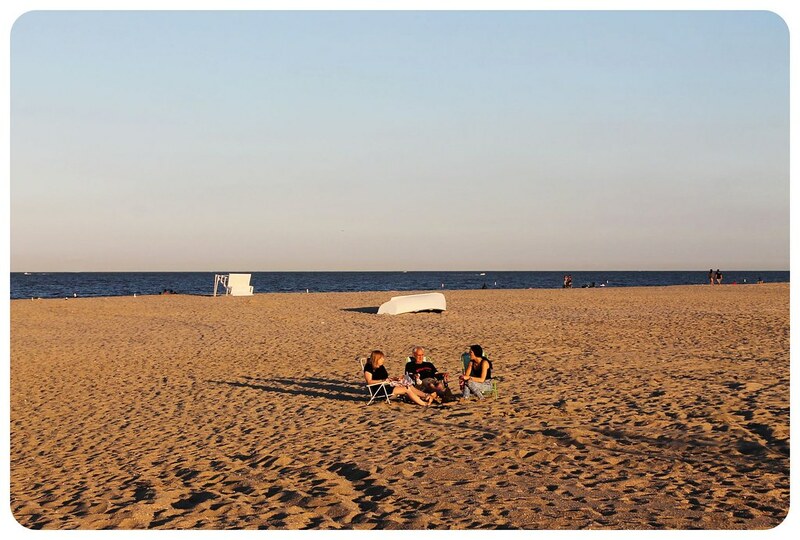 My first instinct was to try a beach I hadn’t been to yet, and people kept recommending Jones Beach and Long Beach on Long Island, but in the end a ferry special for the Sea Streak to Sandy Hook won me over and I decided to return to the Jersey Shore. I loved Sandy Hook: A blissful beach escape from New York City last year, and while I knew I would be limited this time around since I didn’t have bikes for all of us, I knew what to expect and that we’d have a decent beach – which is not easy to find around here, especially when you’re trying to impress someone who is used to Florida’s gorgeous beaches. 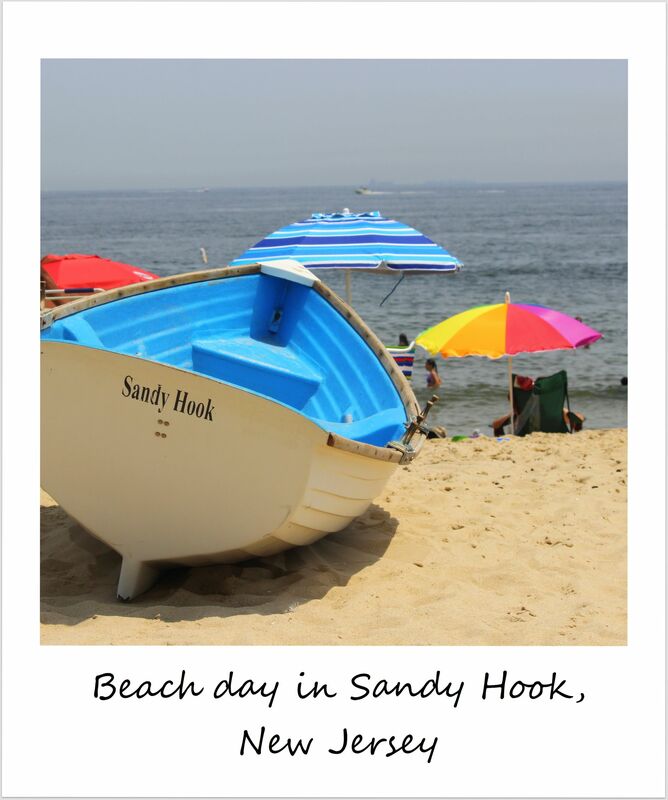 40 minutes after boarding the ferry near Wall Street we stepped onto the sandy shores of aptly named Sandy Hook – it doesn’t get much easier to get to a beach from NYC! – and an hour after leaving New York, we were already sunbathing. For my first beach getaway this summer, I couldn’t have chosen a better place, and I hope I’ll have time for another beach day before I leave for Europe. It’s been nearly a full four weeks since I arrived in New York and I noticed last week that I didn’t go on a single trip this past month – very different from May, when, in Arizona, I went on day trips to explore the Sonoran Desert almost every other day. 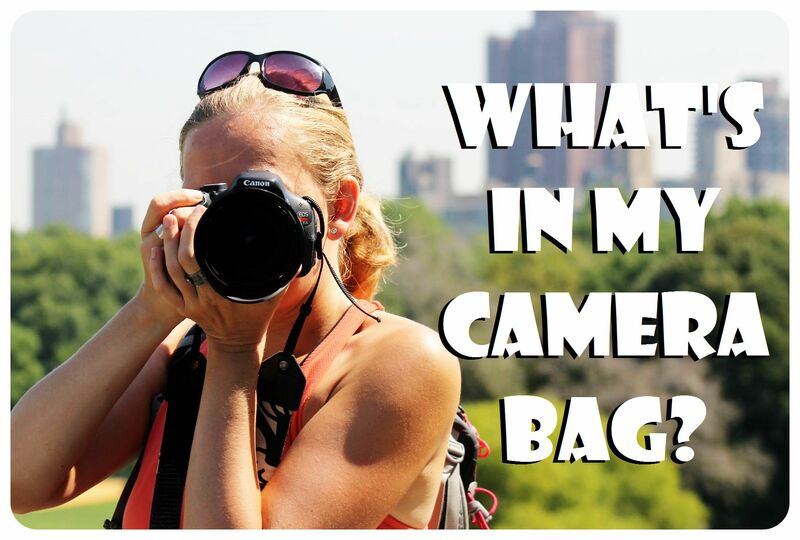 So I decided it was time to up my travel game a bit, even if it’s just for a quick trip out of the state – and luckily, that’s fairly easy in New York, because New Jersey happens to be just on the other side of the Hudson River. So why not pop over to Jersey during a run? 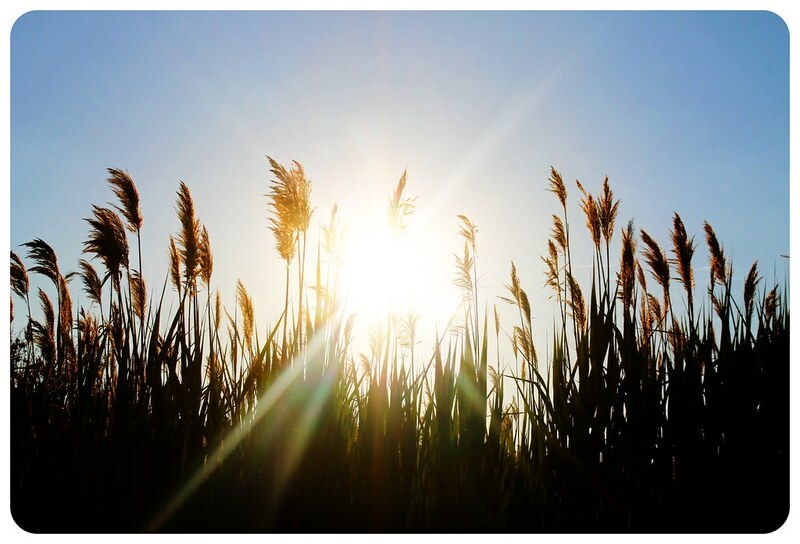 There’s a bit of a pre-story to this – I don’t think anybody in their right mind just happens to think about running over to New Jersey (and back) – but last summer when I first moved to New York I lived in a place on the Upper West Side which was close to both Central Park and Riverside Park by the Hudson. While I was training for my first 10k, I’d run up Riverside Park to Harlem and Washington Heights and see the mighty George Washington Bridge spanning over the Hudson in the distance. Every time I thought: ‘One day I’ll run over to Jersey.’ I never did though, because it was pretty darn far. But once I hatch a plan, I usually go through with it and so it seemed the perfect opportunity to finally run to New Jersey when I realized I hadn’t left New York City all month. It was an ambitious plan to run this distance: Despite the fact that I am running almost every day, running a 10k from where I was staying in Manhattan to Fort Lee in New Jersey, and 10k back isn’t just a leisurely afternoon workout for me – but the more accomplished I felt when I got back and had made it in under 2 hours. 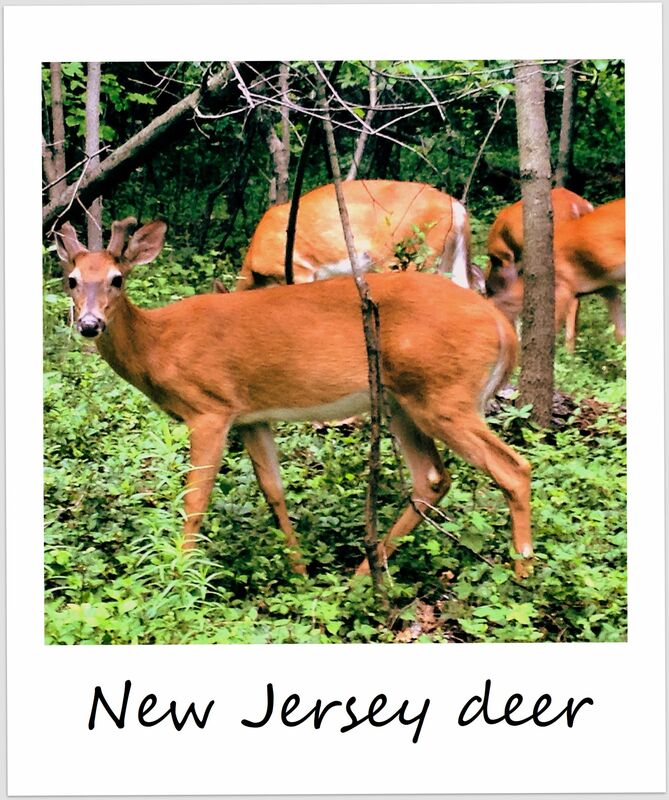 It was also a wonderful reminder that you simply need to leave the island (aka Manhattan) and you’ll find yourself surrounded by nature and wildlife – I am sure that my excitement about the group of deer I bumped into on ‘the other side’ provided me with the endorphins I needed to make it back. Main lesson learned this week: I need to leave the city more often! And it just so happens that I’ll do exactly that in July, but more on that in my monthly round-up on Tuesday. This week’s Polaroid is coming a little early since I’ll be sharing my upcoming travel plans and other happenings in my Life Lately post tomorrow.. so stay tuned for a long-winded post on where I’m off to next week and I why that was such a hard decision to make for me. 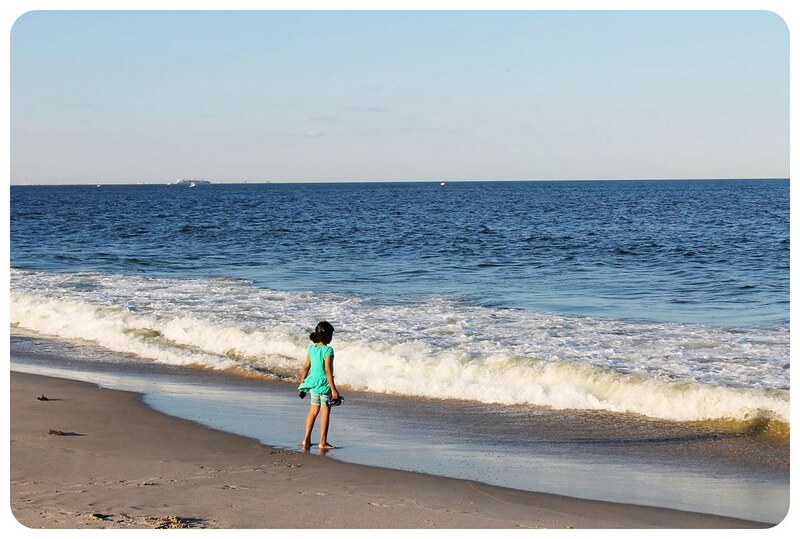 But before talking about leaving the U.S. : I had planned to return to the beaches of New Jersey all summer, after I was so pleasantly surprised by the beaches of Sandy Hook in June. 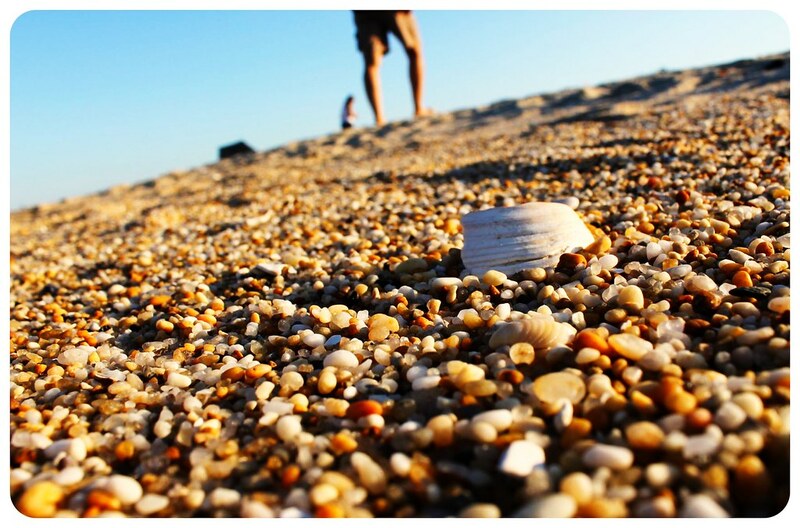 Somehow, the summer flew by and there was barely any time left for an exploration of the Jersey Shore, until last weekend! But when I finally sat on the train to Jersey, bikini and sun tan lotion packed, it started to rain. My highly anticipated beach getaway got rained out. My friend came up with a Plan B quickly though, and decided to take me to Grounds For Sculpture, one of her favorite places in Jersey. I love public art and sculptures, so I wasn’t too bummed about missing the beaches that day (there’s always a next summer, right?) and once we arrived at the park, I might have even been happy about the cloudy skies and rainy weather: the sculpture park was so much more amazing than I had expected! 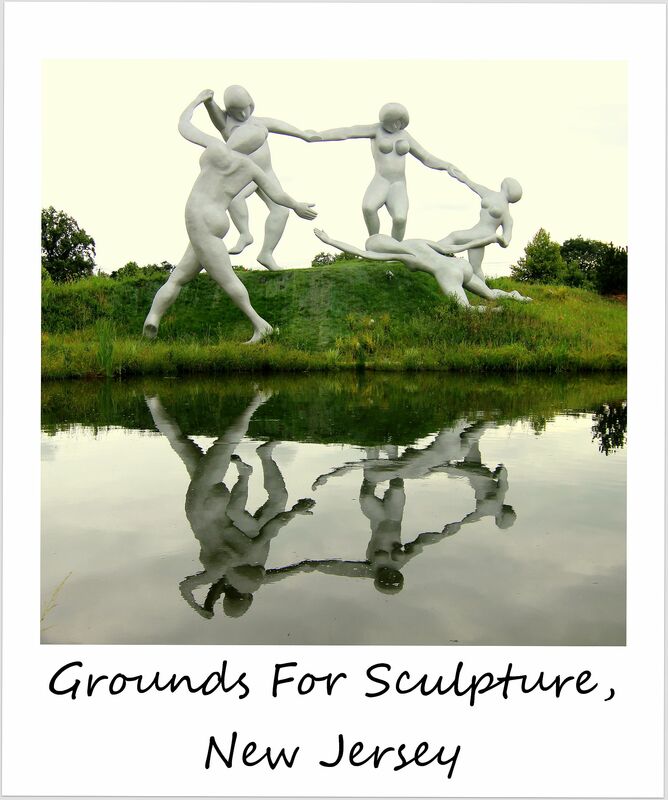 Grounds For Sculpture is a massive park of 42 acres / 170,000 m2 and home to more than 270 large contemporary sculptures, many of which are made by internationally renowned artists. All of the pieces are stunning, with a great mix of thought-provoking art, humorous sculptures and incredibly innovative work. I even reunited with the fabulous Seward Johnson ‘Forever Marilyn‘ sculpture that I had seen in Chicago in 2011 for the first time! I loved the amount of interactive sculptures that invite visitors to be part of the display – at least temporarily. We spent hours roaming the grounds, and could have easily spent longer, but we decided to head to the famed Rat’s Restaurant instead, which sits in a beautiful setting by a water lily-filled pond right on the grounds. If you ever find yourself in that area, I highly recommend stopping by Grounds For Sculpture. Rushing to and from meetings again, to networking events, visiting friends in other parts of town – somehow I always find myself on the go in New York. And while I was running to catch a subway the other day, traversing thick traffic on Broadway, making my way through the crowds on the sidewalk, I realized that I was in urgent need for a break from the city. One thing that I love about living in New York though is how close it is to nature – beaches and mountain getaways are only a stone’s throw away. My list of places I’d love to visit around New York is already longer than the list of places I’d like to see in all of Europe (okay, I might be exaggerating here) and there’s no way I’ll get to see even just a handful of them before I leave, but one place that was high up on my list was the Jersey Shore. 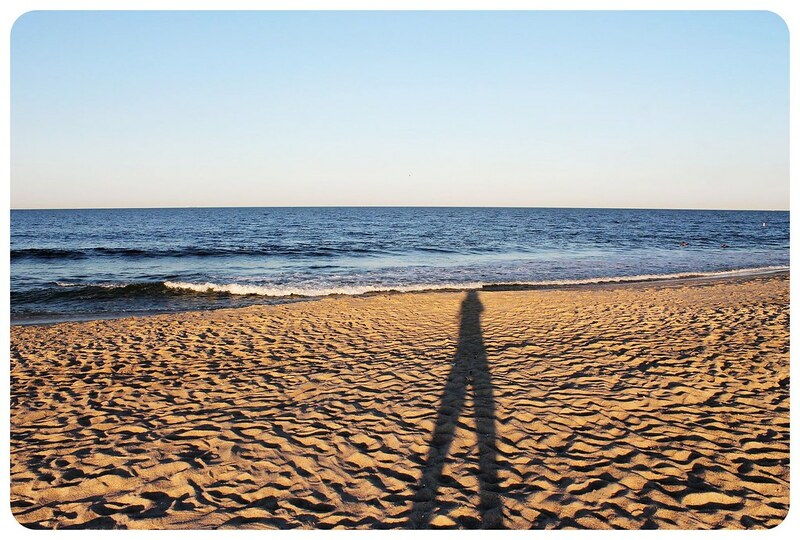 I had heard tales of beautiful sandy beaches from Jerseyans and New Yorkers alike, and was curious to see if they really lived up to the glowing picture people painted of them. After all, everything I had known about the shores of Jersey was what I had seen on a certain TV show, and that place didn’t look very idyllic and enticing. When I was invited to a beach day by some friends, including a Jersey girl with a car and four bikes, I didn’t have to think about it but started right away to throw my sarong, my bikini and some other things in my bag. 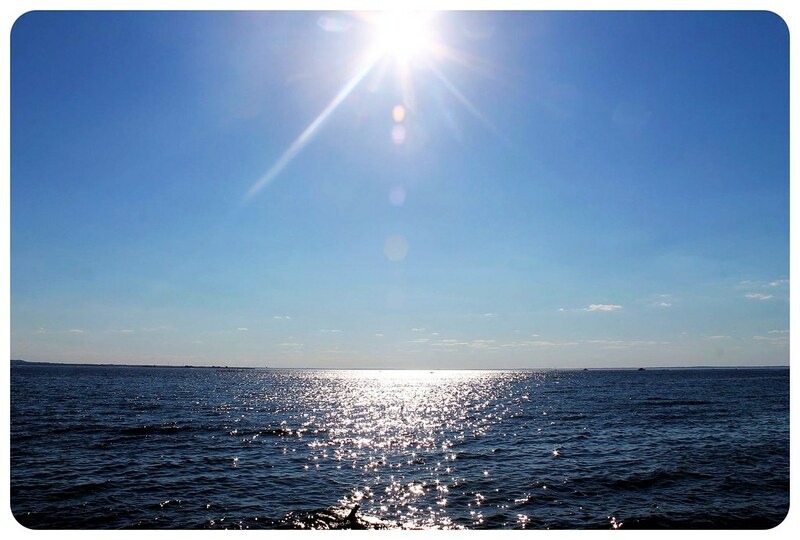 Her suggestion was to visit Sandy Hook, a super thin peninsula that juts up into the Lower New York Bay and borders the Atlantic Ocean on the far northwestern end of New Jersey. We sped off towards the coast, and as soon as the ocean came into sight I couldn’t believe that this was the Jersey Shore. Little white sailboats were softly swaying in the bright blue water, and rolling sand dunes were separating the lush green holly forests from the golden sand beaches. We parked the car at the northern tip of the peninsula, where you still find remnants of the old army base of Fort Hancock and the oldest continuously operating lighthouse in the U.S., dating back to 1764. Fort Hancock used to be a significant army base because it was in charge of protecting the New York harbor from 1895 to 1919. 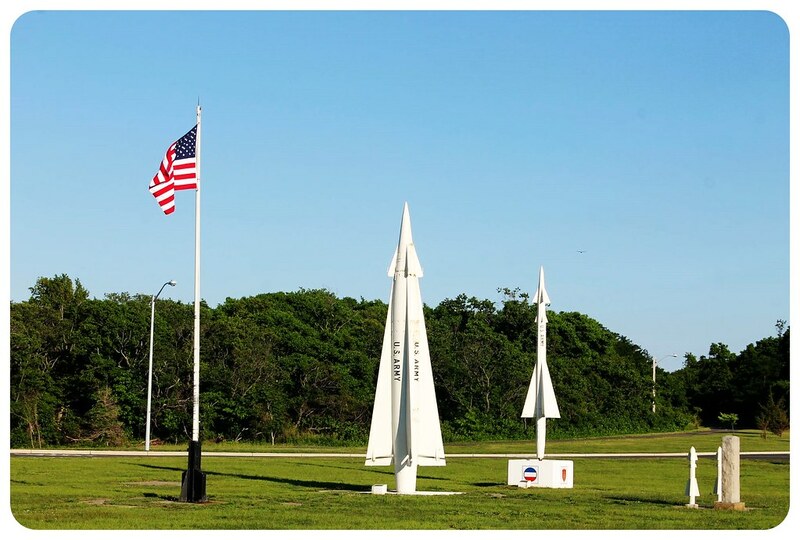 The military structures, most of which are still intact, include gun batteries and army barracks, and later even Nike Missiles as well as missile bunkers which were installed during Project Nike, a line-of-sight anti-aircraft missile system developed during the Cold War, to protect the Greater New York area. 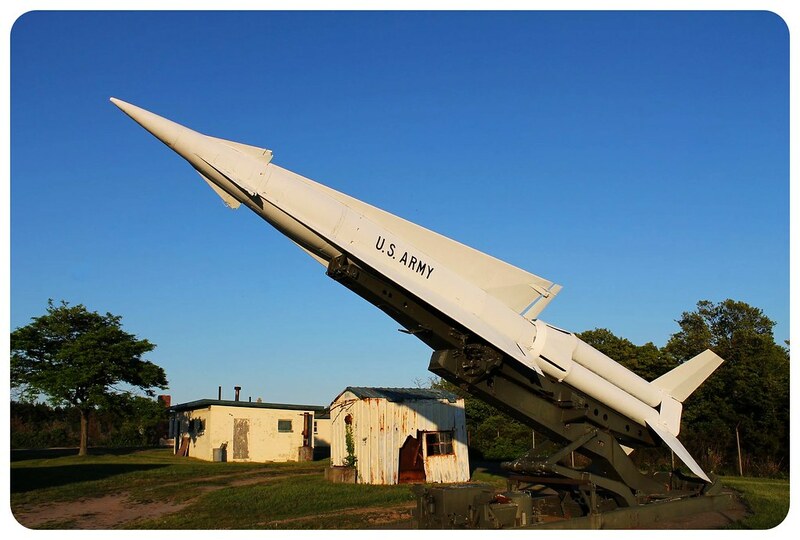 While the missiles feel strangely out of place in what has become a popular getaway for beach bums like me, but also for bird watchers (there are over 300 species of birds on this tiny headland!) 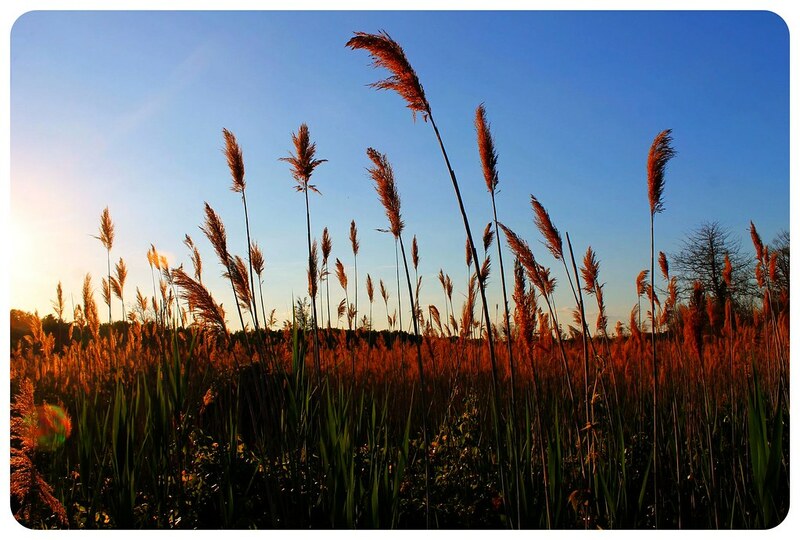 and nature enthusiasts, they played an important part in the history of Sandy Hook and are now included in the National Register Of Historic Places. 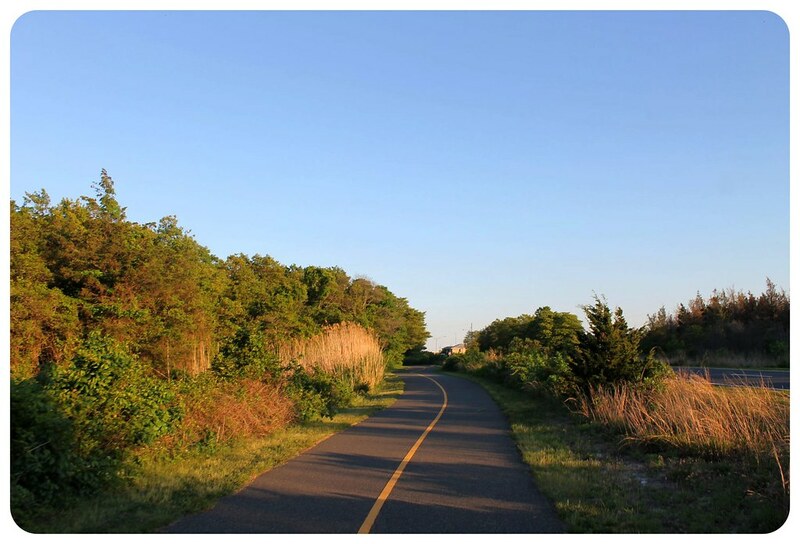 After a quick ride around the army barracks, we set off on the five-mile bike/roller blade/walking path that is trailing through the forests and the salt marshes along the beaches and the long golden stretches of pristine beaches. You can basically cycle almost the entire length of the Sandy Hook barrier spit, which is only 6 miles (9.7 km) long and at a width of 0.1 to 1 mile (0.16 to 1.61 km), you’re always close to the beaches on both sides. 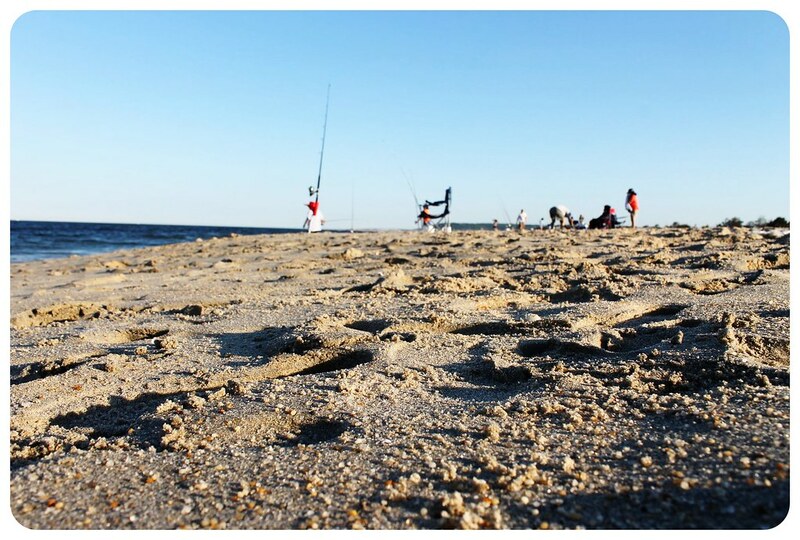 Sandy Hook is not only popular with beach goers, but also with fishermen. We saw dozens of them sitting relaxed in their foldable chairs, their fishing rod sticking in the sand in front of them, waiting for something to bite. If you are more active, you can also spend the day hiking through the dunes and forests – there are several hiking paths beginning at Area M near Nine Gun Battery, the Spermaceti Cove Lifesaving Station and at the entrance to the Recreational Area – pick up a brochure that details the trails when you enter the park. Water sports fans will of course find everything they could possibly wish for, from canoeing and kayaking to wind surfing and kite surfing. 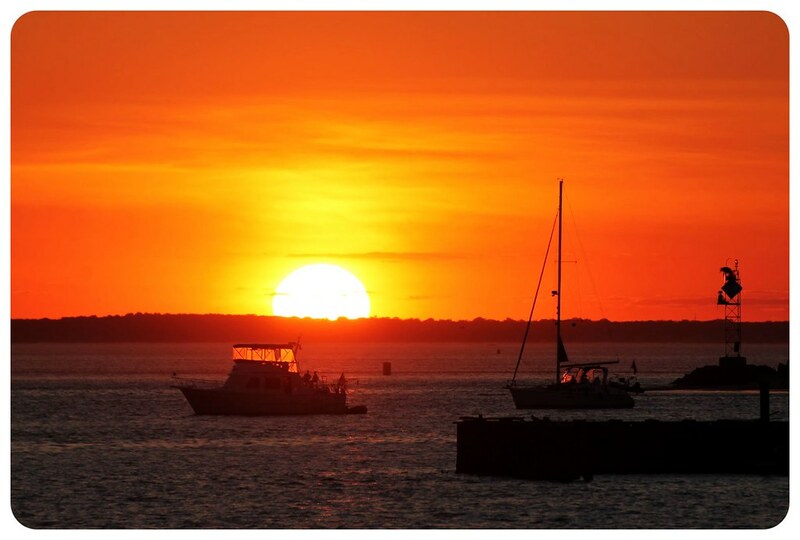 You could also just park your car at the far northern end of the peninsula and have a picnic at North Beach, from where you’ll see New York City’s skyline glimmering in the distance. For me, the beach day could not have been better. Having laughs with good friends and combining a workout (the cycling) with tanning was exactly my kind of day. 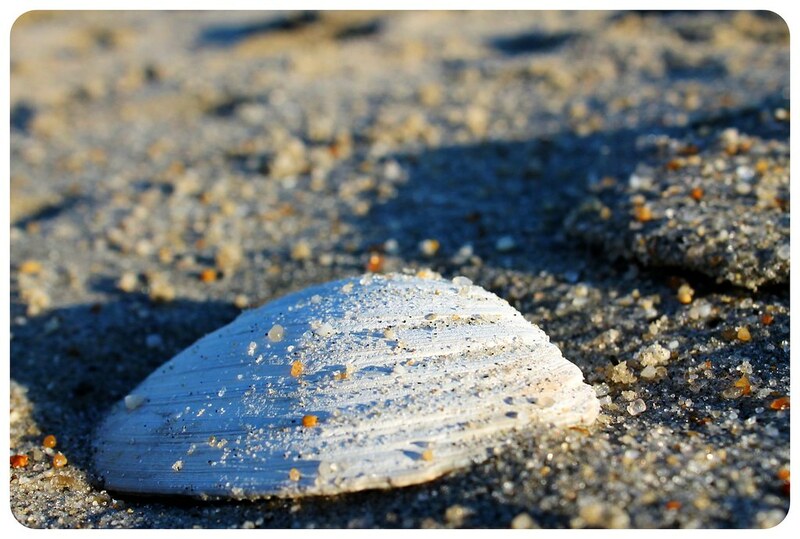 We cycled, stopped at various beaches, tanned, watched the nudists at Gunnison Beach (just kidding – they are a little bit further down from the normal beach; but Gunnison Beach is in fact the only optional clothing beach in all of New Jersey! ), cycled further, stopped for a picnic, watched the fishermen, and finally decided to turn around so that we’d make it back up north in time for the sunset. And what a sunset it was! I swear that I didn’t add any color to these photos, this is the true color of the sky that night. It was one of the best sunsets I had seen in a long time. 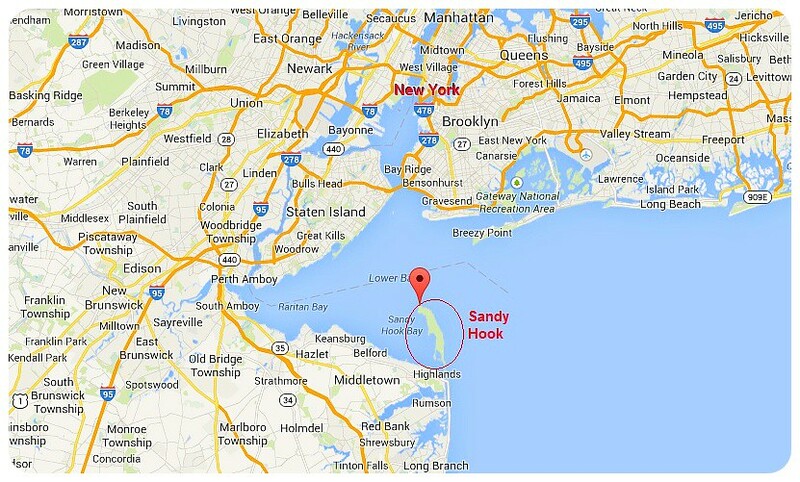 From New York City, you can take the Seastreak Ferry and it brings you to Sandy Hook in only 40 minutes! The ferry leaves from Pier 11/Wall Street or East 35th St./FDR and is $45 for a round-trip ticket (kids go free on weekdays, $17 on weekends). You can look up the ferry schedules here. For cars, check the directions on the National Parks website. 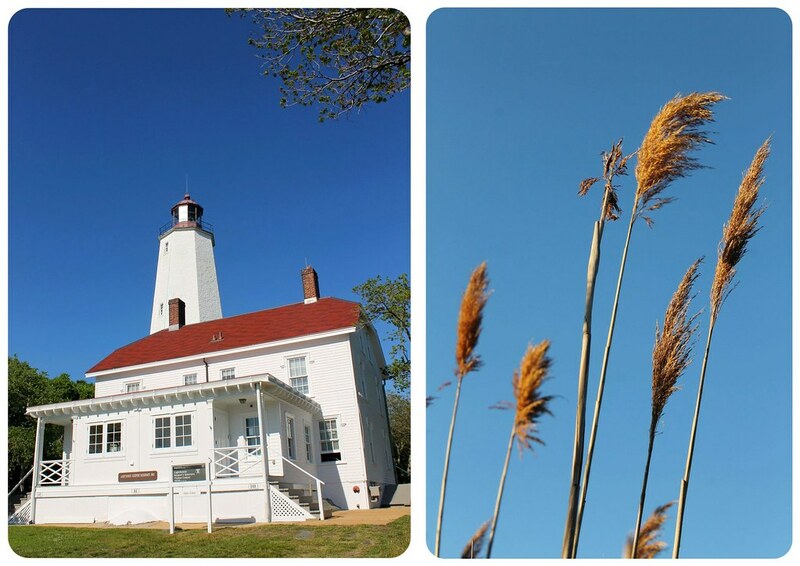 There are a few B&Bs in the nearby town of Highlands, and you can camp in Sandy Hook. You can camp in the summer near the H parking lot. During the summer months, there are some food trucks, but you’re better off bringing your own food and drinks. There are no restaurants inside the park, the closest ones are in Highland. If you bring a picnic, there is a great picnic area with tables on the North Beach Observation Deck – you have excellent views over the New York City skyline from here. If you’d like to have a barbeque, grilling is only allowed in Guardian Park in Fort Hancock. Make sure to bring cash, since there are no ATMs in Sandy Hook, and don’t forget your bathing suit, a towel, sun screen, water and your camera! 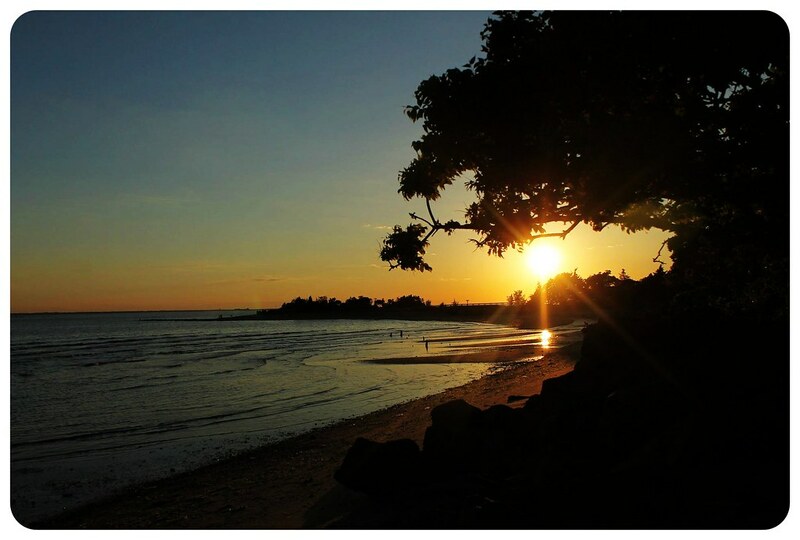 If you are planning to camp here or stay for the sunset, bring mosquito repellent – the bugs attacked us like crazy once the sun started setting. Tip: You can rent bikes right at the ferry pier at Ray’s Bike Rentals.